....because there is rarely a short-cut through mountain country (if there was you can bet the Germans would have turned it into a road), and good advice that isn't good is just opinion and stupidity pretending to be advice. So, it was probably a bit daft of me to think I could shave some distance off Herzog's route by straight lining across the mountains (topping a thousand meters in places - not impressive if you're reading this in Switzerland or Nepal, but higher than Ireland's highest peak). Off I set last night into dark and drizzle. I'd been given some advice at the ruined castle (another one) above Hornburg by a chap in tweeds walking a Labrador - obviously trustworthy. Follow the red diamond route he said. 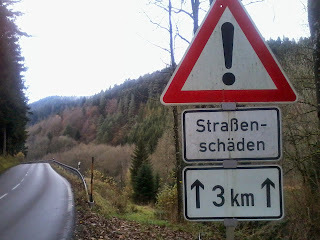 I did and added several kms to the steep climb to reach a sort silvian cross roads. There by luck there was a rare shelter hut. Rain proof roof, three walls, veranda and table and bench. Paradise especially as temperature was dropping. I made my stand for a night of luxury. The sun flooded into the cabin this morning. As I was packing a jolly man of the mountains came trotting along. We conversed, in German. Klaus Kinski was mad, we agreed, whilst Herzog was admirably obsessive. The climate was odd - pleasant for November but odd. Oh, and rather than descending and climbing and upping and downing I'd be much better off following a longer, smaller track straight to Elzach that followed contour lines. Yes, I agreed, but not if it's going to get me lost. Nein, nein, it was straight forward - only a few cross tracks but it would be 'logical' which way to go. I set off keenly. An hour later I'd arrived at one of those useful map boards - this clearly showed no obvious straight route to Elzach as there were two big streams in deep valleys, as well as the region's highest peak in the way. In fact I should have followed my original idea and headed downhill from the cabin and got to the Elz river and trotted along beside it and been in town for an early lunch. As it was, realising I'd have to double back I went back to compass and intuition and followed a deer track, then a wander weg and finally a logging road that got me to the river. And here I am in Elzach for a late tea and ten miles behind schedule and footsore. I'd be less gruntled but I've spent a glorious day walking the heights of the best of the Schwarzwald in spring-quality sunshine. I'll walk on over the last of the Black Forest mountains tonight - boringly following the road, because wind as it does it will still be the easiest way. A brisk day tomorrow should get me to Ettenheim, ready to cross the Rhine into France. But first - tomorrow night - I plan a cheap room and a massive clothes wash. France deserves that much at least. As I walked last night there were moths still flying. In mid-November. So far, thankfully I'm not getting the full Herzog snow 'n' rain experience. On the other hand he was driven to taking a room most nights to be able to sleep. Swings and roundabouts. I'm still enthralled by the Schwarzwalders gaeity after the - I'm sorry but - stolid seriousness of the Schwabs. The five elderly women have just broken into five-part harmony in a song to serenade their - seriously - cake. Rather a fine gateaux as befits the location, admittedly but still bonkers and charming. It's rather a smart café and invaded favoured by matriarchs of a certain stern bearing. I look like a meth's drinker spending the proceeds of a day's pan-handling. Yet as they pass each greets me with a cheery 'gruss gott' or similar. And smiles. I do indeed feel like a pilgrim, both bestowing and garnering blessings as I walk. Perhaps I won't stop when I reach Paris. Or perhaps I won't reach Paris. There's still 250 miles/400 kms to go, and I'm a day behind my notional schedule and four behind Herzog. It's not a race but one has to keep going.